Search Results for "iceberg lettuce"
Slicing fresh iceberg lettuce on a wood cutting board. Chef pours salad with olive oil. 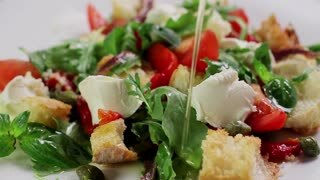 Delicious salad with bread crumbs. Healthy food. Aerial drone shot over the rows of a lettuce field. Salad with shrimps and ingredients on a wooden background. Salad pour of balsamic sauce. green vegetables served by the cutting board. knife lays on the white desk. Caesar salad in red plate. Caesar salad consists of roasted chicken breast, iceberg lettuce, tomato, parmesan cheese. Popular dish of European cuisine and cuisines of other countries of world. Caesar salad in red plate. Caesar salad consists of roasted chicken breast, iceberg lettuce, tomato, parmesan cheese. male hands in white gloves prepare food for cutting. man puts green bunches by white board. Dragon Fruit Salad, with Cherry tomatoes, Iceberg lettuce and grapes. Close up of a chef finely chopping a head of iceberg lettuce and placing it in to a neat pile. Aerial drone view of farmers and a tractor picking and sorting iceberg lettuce in a field. Up close slow panning shot over an iceberg lettuce field. Slow motion shot of an iceberg lettuce field with a truck in the background driving away down a road. Slow motion shot of farmers picking iceberg lettuce in a field and tossing into their baskets. 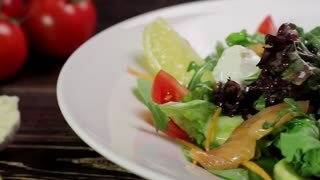 A slow motion zoom shot of a field iceberg lettuce with farmers in the background. A slow motion shot of iceberg lettuce in a field, with farmers working in the background, in Mexico. An up close slow motion shot of iceberg lettuce in a field, with farmer in the background. cook serves food on the table. male hands in white gloves sorting out green stuff. white cutting board served on the table. knife is serving on the desk. hands in white gloves serving green vegetables on the table. knife, cutting board and food on turquoise background. male hands in white gloves taking bunches. vegetables on a turquoise background. male hands lays out green vegetables. onion, iceberg lettuce, parsley and dill by the cutting board. 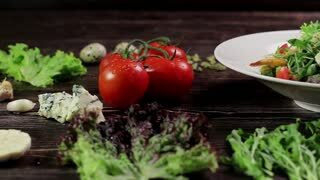 Slicing fresh organic vegetables for gourmet burger garnish.